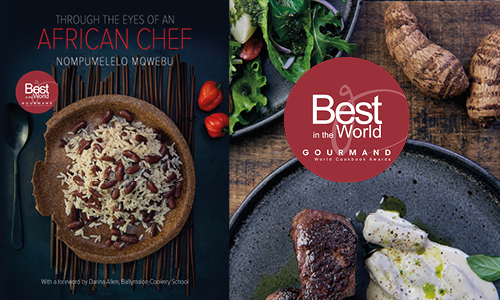 Quickfox Publishing author Nompumelelo (Mpume) Mqwebu pulls it off at the 2018 Gourmand World Cookbook Awards by winning the prestigious “Best in the World” award in the Self-Published category. These international awards, considered to be the Oscars of the culinary scene, featured over 1372 finalists competing in 130 categories from 134 countries and regions in the final leg of the competition. The competition, in general, attracts entries from traditional publishers, self-published authors, food personalities, chefs, restaurants, food magazines, and much more. Categories are also very diverse. Winners from each country qualified for entry into the final event in their respective categories. Mpume qualified by winning Best in South Africa in both the Self-Published and First Cookbook categories. This year the awards ceremony was hosted in Yantai, China in late May 2018, for which Mpume flew over to attend. Four other South African titles were also honoured at the 2018 awards. NB Publisher’s books published under the Human & Rousseau imprint won in their respective categories, with one NB title coming in third place. Callie Martiz and Mary-Louis Guy’s The South African Milk Tart Collection came third in the Pastry and Desserts category. Alix Verrips’ Brunch across 11 countries won Best Breakfast Book. Susie Chatz-Anderson’s A Bite of Latin America won the Best Latin America outside of Latin America category. Jan-Braai’s Shishanyama won the Barbeque category. We are very proud to have been part of this project and we are deeply grateful that Mpume put her trust in us for the editorial management, editing, proofreading, design, DTP and printing of the book. Visit Through the Eyes of An African Chef on Publisher.co.za to purchase your copy today. Quickfox Publishing is a small, dynamic team of multi-skilled publishing professionals. Our Cape Town-based office oversees every project that comes through our doors, offering hands-on personal service to each and every client and strong attention to detail on all projects.